Cardiac CT could be included in the workup of patients suspected of having cardioembolic stroke, according to an article from Saudi Arabia published in the Journal of Computer Assisted Tomography. This imaging examination may help physicians detect major embolic findings not identified by transthoracic echocardiography (TTE). As high as 40% of stroke patients may have an embolic origin, according to published literature. Cardioembolic stroke is also a frequent cause of later recurrence after transient ischemic attacks. Because of this risk, identifying an embolic origin for stroke is of clinical importance with management aiming for preventing future events. TTE as a widely used imaging exam to identify cardioembolic stroke, has well known limitations. It is not most optimal for evaluating the left atrial appendage or the aorta. It is operated dependent, and it requires the availability of specialized expertise. Lead author Amr M. Ajlan, MD, a consultant cardiothoracic radiologist at King Abdulaziz University Hospital in Jeddah, and his colleagues identified all patients with documented stroke that had a cardiac CT scan between June 2012 and December 2014. 47 patients were identified. 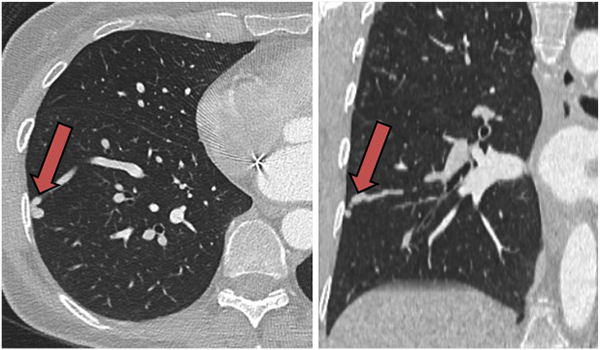 malformations (arrows) in a 56-year-old woman with stroke. 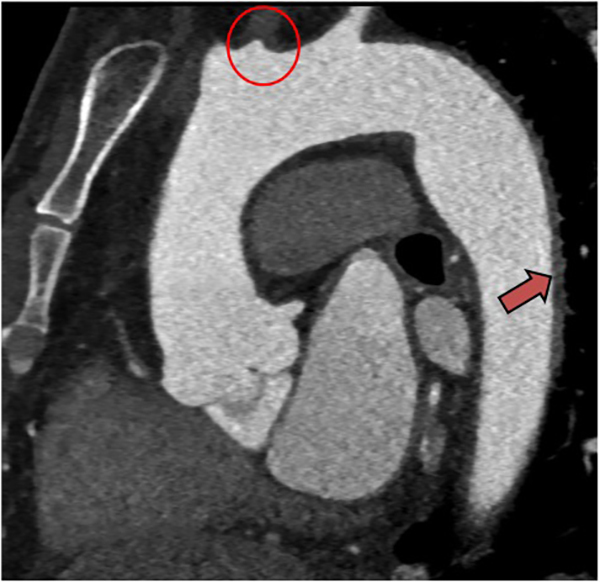 The radiologist who retrospectively reviewed the scans for the presence of findings of major embolic potential findings that included intracardiac thrombi, intracardiac tumors, intracardiac vegetations, aortic arch atheroma, evidence of myocardial infarction, left ventricular aneurysm, features of cardiomyopathy, mitral valve disease, intracardiac and extracardiac shunts, and signs of aortic/major aortic branch vasculitis. Echocardiographic reports were then compared against the CT findings. Additionally, the radiologist documented any potentially significant stroke-unrelated findings and coronary arterially disease (CAD). Cardiac CT showed major embolic potential findings in 10 patients, none of which had been documented in echocardiography reports. Findings included five cases of cardiovascular thrombi, two cases of vasculitis, and one case each of metastasis invading the left superior pulmonary artery, myocardial infarction, and pulmonary arteriovenous malformations. However, there were two cases with major embolic potential that were identified on echocardiography but not on CT. Additionally, the CT scans showed 16 potentially significant stroke-unrelated findings and 21 cases of CAD. “The results of this retrospective descriptive study support an additive value of using cardiac CT in the evaluation of patients suspected of cardioembolic stroke….Such value of CT is even more notable in real-world settings of nontertiary care practices where clinical or logistic obstacles limit obtaining clinically useful echocardiographic reports,” the authors wrote. Ajlan AM, Bagdadi RR, Alama MN, et al. Impact of Implementing Cardiac CT in Evaluating Patients Suspected of Cardioembolic Stroke. J Comput Assist Tomogr. 2016 40;3: 380-386. Cardiac CT helpful in patients suspected of cardioembolic stroke. Appl Radiol.